Imagine the devastation and destruction of lives these drugs would have caused if they had not been found. And then consider the fact that the Democrat Party leadership is hell-bent on stopping President Trump from protecting Americans from this kind of thing by building a wall along our Southern border. They are so single-minded in their determination to enlarge their voting base and secure themselves in power for another generation that they are willing to see innumerable Americans dead and others with their lives shattered, just so they can enjoy the perks and privileges of office. They are traitors and criminals. They found this under the floor of the trailer. They found 114 kilograms of fentanyl. According to the DEA, just two milligrams is considered a lethal dose. They also grabbed 179 kg of methamphetamine and one gram of fentanyl in pill form. 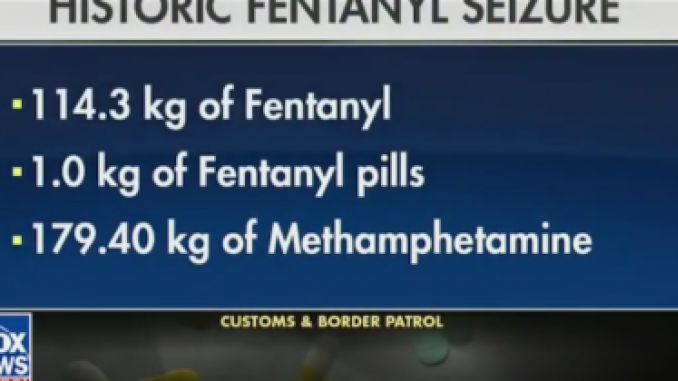 The street value for the fentanyl over $102 million. The CBP officers arrested the smuggler, a Mexican national who attempted to drive the drugs across the border. The suspect was a part of the DHS’s trusted traveler program called FAST, that stands for free and secure trade for commercial vehicles. The program started after 9/11….